Quite out of the blue, a couple of months ago our 24/7 advice line began receiving calls about dogs in the workplace and whether it could be allowed. We didn’t know then that 24th June was International Take Your Dogs to Work Day. Apparently it’s an event that’s been held every year since 1999, and the date set for next year is Friday 23th June. The origins of the ‘day’ come from the USA, where taking dogs to work is a common practice; as many as one in five employers allow dogs in the workplace. These include some large businesses including UPS, the National Air Guard, Amazon and Google. There’s even a website for job-seekers that will filter job vacancies down to ‘dog-friendly companies’. Don’t believe us?! Try it for yourself at simplyhired.com – select US jobs, then use the advanced search and special filters! When you think about it, dogs may be present in the workplace for a number of reasons – but in every case, the hazards and risk created by the dog’s presence will have to be assessed and managed. Employees and visitors should be protected from injury or ill health due to household pets, with risks including being bitten, an allergic reaction or hygiene reasons. Consider what steps can be taken to avoid these risks. In some cases it may also be necessary to consider people who have a phobia or fear of dogs. The obvious solution is to put the animal into another part of the property or a pen while visitors are on the premises. The business should also confirm that their Employers’ Liability (if applicable) and Public Liability insurance cover extends to cover injuries caused by pets. Premises with guard dogs should have warning signs prominently displayed and the dogs should be chained up or isolated when the premises are open to the public. Consider the safety of any staff who might need to visit the premises ‘out of hours’. Make sure there are arrangements in place to cover times when the dogs’ normal handlers are on holiday, poorly or not at work for any other reason. Again, it’s important to check that insurers are aware of and provide cover for the use of guard dogs. Police and sniffer dogs are normally selected at an early age for their potential abilities to respond to commands and controls. That selection, taken with the initial training and testing of both dog and handler before being allowed in a public situation, followed by regular reassessment, is all that’s normally required. Assistance dogs (guide, hearing and helping dogs) are specially selected, highly trained with long-standing ‘tried and tested’ training regimes. The dogs know when they’re at work and will not behave like an ordinary pet. They’re rarely distracted and when accompanying their owners to work will happily rest quietly on a draught-free bed or blanket placed near its owner. To prevent allergic reactions the work area may need to be cleaned more thoroughly that other areas, and the employer will need to ensure that the bedding is regularly cleaned. Arrangements may be needed for the owner or another worker to take the dog outside at regular intervals, to a suitable area, to relieve itself. In practice this is not disruptive to the work activity. Because PAT dogs are usually entering premises where some of the occupants have challenged or depressed immune systems, the key issues to consider will include cleanliness, allergies and infection. Animals in clinical areas pose significant risks to patients who are immuno-compromised, pregnant, have had a splenectomy or suffer from allergies. There may occasionally be problems where they’re introduced to people who are physically or mentally vulnerable. Pets as Therapy is a registered charity that works closely with the National Health Service. PAT registered dogs are assessed for suitability, vaccinated, wormed, protected against fleas and health checked before registration. They operate to a published code of practice. 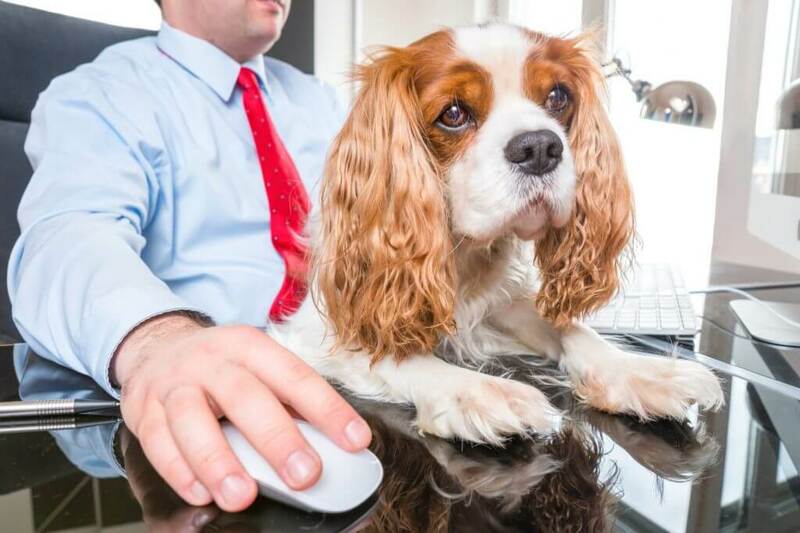 If employers decide that they wish to support Take Your Dog to Work Day or allow pets into the workplace on other occasions, they’ll need to take steps to manage the situation. An assessment of the hazards and risks created by the presence of the dogs will be required in every case. There will be situations where it’s obviously inappropriate, some where it’s inadvisable but manageable, and others where the risks will be minimal. It can only be decided case by case. If you decide to allow the practice, confirm that your Employers’ Liability (if applicable) and Public Liability insurance cover extends to injuries caused by pets. Peninsula’s members not only have access to advice and information on this subject but also the benefit of routine visits from their Business Safety Consultant who will guide them with sensible and pragmatic advice – plus the added benefit of access to a 24 Hour Telephone Advice Service where trained, qualified and competent staff are ready to take their calls.